Candy stood beside the playpen sitting smack-dab in the middle of the room, dangling a rattle in front of her baby brother’s scrunched-up face, willing his wails to stop. “See, Pookey? See the rattle? Here, here . . . you can play with it.” She tried to push it into the nine-month-old’s hand, but he just batted it away and kept on crying. Giving up, Candy threw the rattle into the playpen and plopped down in a chair as far away as possible from Big Otto, her arms crossed. Mama was going out again. She always said they’d be back “in a minute,” but Candy knew better. “How old are you, girl?” Otto growled. Candy flounced out of the room, into the kitchen, and opened the refrigerator door. Leftover pizza box from Domino’s, half package of hot dogs, opened can of refried beans, bag of carrots, grapes in a bowl, an inch of milk in the bottom of a gallon jug, and two more cans of beer from the six-pack. “Where’s that beer you was gettin’ me, girl?” Otto bawled from the other room. Pookey tipped over onto a scrunched-up blanket in the corner of the pen and sucked noisily on the bottle, his cries silenced. Pookey was already sucking air bubbles from his bottle as the door closed behind them. Candy ran to the window and pulled aside the sheet that acted as a curtain, knowing it would take a few minutes for them to go down the two flights from third floor. But then she saw them appear on the walk below, laughing and talking as they headed for Otto’s car parked across the street. Running back to the couch, Candy pulled at the square couch cushions and flung them onto the floor. Yes! Several pennies, even a nickel and a dime, sat among the crumbs, pull-tops twisted off cans, rubber bands, and other small trash that collected under the couch cushions. Especially after Otto was here. Pulling the couch away from the wall, Candy retrieved a glass jar half full of pennies. Unscrewing the lid, she dropped her new finds into the jar, then screwed the lid back on. Pookey had pulled himself up to a standing position and was holding onto the side of the playpen. Whimpering, he threw out the empty bottle. Kneeling down until she was nose-to-nose with her little brother, Candy shook the jar of pennies. “Can you keep a secret, Pookey? I’m savin’ up these pennies to buy me a bike if Mama don’ get it for me. But here . . .” She leaned over and set the jar down in the middle of the playpen. “There. You can play with it for a little while. See? 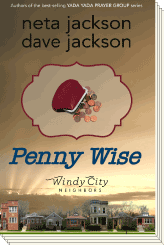 It makes a pretty noise.” She shook the jar until the pennies tinkled and clattered. Pookey dropped to his knees and reached for the jar, momentarily distracted. Huffing, Candy replaced the unwieldy cushions, then flopped onto the couch and sighed. So. How long was it going to be this time? Michelle Jasper stood in the middle of the living room, eye-to-eye with her thirteen-year-old daughter, trying not to look impatient. They should be going out the door. Why did teenagers always pick the most inopportune times to ask these questions, acting like they’re gonna die if they don’t get an answer right now? “Oh, all right.” Tabitha flounced off toward her bedroom. Where were those boys? Where was her husband, for that matter? They’d just talked about this at supper, joining the other neighbors on Beecham Street to welcome back old Mrs. Krakowski, who’d fallen last winter and broke her hip. The two-flat she’d owned had been in foreclosure. But when the new owners heard the sad tale, they’d had a better idea . . .
“Boys!” Michelle headed for the kitchen. The doorbell rang. “I’ll get it!” Tavis darted out of the kitchen. “Wait for me!” Tabitha yelled, heading for the front door with her twin brother and his friend. “I wanna help too.” But pausing in the doorway she said, “Promise you’ll think about it, Mom! And talk to Dad, okay?” The door slammed behind her. Neighbors from their block on Beecham Street milled around the sidewalk and small front lawn in front of the Bentleys’ two-flat—which used to be known as “the old lady’s house” before she fell down the basement stairs last winter, broke her hip, and spent months in rehab. The bank had foreclosed on the two-flat and the Bentleys had bought it. Which was nice for Tavis, since DaShawn lived with his grandparents in the second floor apartment and was in the twins’ class at school. “Oh, honey, tell me about it.” With a chuckle, Estelle Bentley moved away with her tray, offering hot chocolate to Farid Jallili and his scarf-wearing wife, who lived next door to the two-flat, as well as the Jewish couple from down the street. The gay couple who lived next to the Jallilis was talking to the man who’d built that huge house on the cul-de-sac at this end of the block. Interesting. Michelle sipped her own hot chocolate. Beecham Street certainly had turned into a mini–United Nations over the years. Hadn’t she read someplace that this whole north end of Chicago was one of the most diverse in the nation? Not exactly a melting pot, though. She barely knew most of the neighbors. “Becky, why don’t you take Nathan and go play with some of the other kids?” The man waved them off. Michelle smiled. The Bentleys must’ve asked Grace Meredith, who lived next door to the Jaspers—the one who traveled around singing Christian concerts—to kick off the song. But they were obviously supposed to join in. Squinting at the words on the slip of paper she held in her hand, Michelle realized the words had been rewritten to fit the occasion. Some of the neighbors were singing the traditional New Year’s song, and some were singing the new words. But even though the song was kind of ragged, tears slid down the old lady’s face, which had a smile on it bigger than the full moon peeking through the clouds overhead. As the last lines of the revised song died away, people shouted, “Welcome home, Mrs. Krakowski!” and Harry and Estelle Bentley escorted their new renter up the porch stairs and into the newly remodeled first floor apartment. Word was that the place used to be a real dump inside. Not anymore. Michelle watched, strangely touched. Nothing like this had ever happened on Beecham Street that she could remember—and they’d lived at 7337 Beecham ever since the kids were small. They’d always been grateful for a quiet block, everybody just minding their own business. But that was before the Bentleys moved in. Harry and Estelle Bentley had gone around to every house on the block introducing themselves and handing out cinnamon rolls. The warm, gooey, homemade kind. “What cheerleading camp?” Her father unlocked the minivan and slid in.